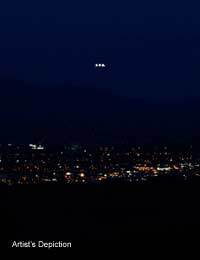 One of the most remarkable modern UFO cases is what has come to be known as the “Phoenix Lights”. Like many other UFO incidents, it was characterised by the sighting of strange lights in the sky. What made it special were two things: the lights appeared to belong to a craft which was colossal in scale, spanning much of the sky; and the sighting occurred over a populous urban area, ensuring there were a large number of witnesses. It all happened on the night of March 13, 1997. People in the U.S. state of Arizona began noticing strange orb-like lights in the sky. The orbs flew around in little patterns, exhibiting occasional bursts of speed and flight characteristics that put them well beyond the range of conventional aircraft. Sometimes the orbs would appear to wink out, though some have suggested that this may have been because a nearby mountain range, which would have been invisible in the darkness, intervened between the object and the viewer. Many of the Phoenix Lights witnesses describe seeing a V-like pattern of lights progressing across the sky. Whether this was a number of smaller objects moving in formation or whether the lights were only the most visible part of a huge craft is unclear. There certainly are many reports of a huge craft being seen. Eye witnesses describe it as being between one and two miles wide. Some say it passed directly over their heads, in complete silence, no more than 150 feet above the ground. They claim to have seen rectangular panels on its under-body and that its metallic surfaces reflected the street lights from below. One of the most striking features of the Phoenix Lights incident is the number of photographs and video recordings taken of it. There are quite a few images of the orb-like lights in the sky, some of which appear to be either moving in formation or simply attached to some huge vehicle. Alas, no one managed to capture any close-ups of the giant craft. The incident made the headlines at the time and there were calls by politicians to investigate it. This went nowhere and the issue was dropped. Indeed, the then Governor of Arizona, Fife Symington, initially made fun of the UFO reports. At a press conference, he solemnly announced that the perpetrator had been apprehended - before one of his staff members walked in dressed in an outlandish alien costume. In 2007, however, the now retired politician took a different tack. He confessed that he had actually seen the objects in the sky himself and thought that they were “some form of alien spacecraft”. “It just felt other-worldly,” he said. “In your gut you could just tell it was other-worldly”. He excused his earlier behaviour by saying that he didn’t want to stoke up public alarm. Sceptics have come up with alternative explanations for the Phoenix Lights sightings. They say the lights were flares being dropped by military aircraft exercising over the nearby Luke Air Force Base. Witnesses tend to scoff at this explanation, asking how flares can move in perfect alignment across the sky. Indeed, if the chronology and location of eye witness reports are compared, they are consistent with a large aircraft slowly transiting the skies of Arizona. It is difficult to see how flares at Luke Air Force Base could account for the geographical spread of the reports. The Phoenix Lights incident turned many sceptics into believers. Some of the imagery captured on that night is fascinating. And strange lights in the sky have been spotted several times in Arizona since then – but never again with so many witnesses.